Anyone who knew Mark understood that he was a versatile person who excelled in the areas of academic performance, athletics and scholastic leadership. Mark's character and personality were the foundation for his successes. His attitude toward life and people was consistently optimistic: it didn't matter what was thrown his way, Mark "never sweat the small stuff" and enjoyed walking life's many roads. 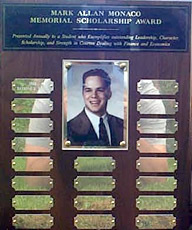 In memory of Mark and his outstanding accomplishments, 'The Mark Allan Monaco Memorial Scholarship Award' is presented annually to a student who exemplifies outstanding leadership, character, scholarship and strength in courses dealing with finance and economics.